Download this veterinarian email list and connect with pet-loving medical experts throughout the US. This leads list consolidates the direct contact information of numerous veterinarians spread throughout the country into one ready-to-download, easy-to-use directory. Find veterinarian emails, phone numbers, and more! 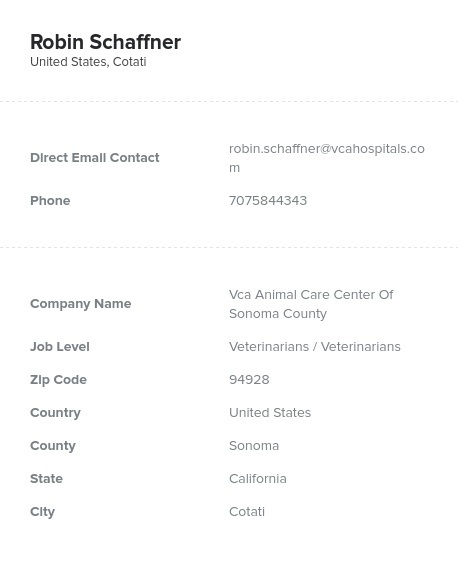 Buy this list of veterinarians' contacts and start communicating with professionals who work closely with animals all across the US after just a few clicks. Within minutes, you can download, integrate, and start using this amazing tool. Our veterinarian email list is full of the contact information you need, from veterinarian email addresses to fax numbers, and can help you build stronger connections with the professionals most likely be interested in your animal-centric product or service. This highly qualified veterinarian mailing list can help you to make more sales, get more recognition by medical experts, and network with a widespread group of highly qualified professionals with ease. You can use our downloadable vet email list to market a variety of products and services: dog and cat food, flea medication, safety equipment, collars and harnesses, horse blankets, and animal-focused pharmaceuticals. Whether you want to market your magazine, medical equipment, or line of pet toys, this useful US-based veterinarian email database offers a great way to reach out to qualified, knowledgeable, pet-focused professionals in a meaningful way. Easily call and email leads using accurate, human-verified veterinarian email addresses. This quality, premium data is highly sought-after by those marketing pet products but can be purchased today for an affordable price. Download this valuable list of veterinary sales leads for your business and conduct your targeted, animal-focused B2B marketing campaign effectively!